Cup plant, Silphium perfoliatum, bloomed one day after Garden Bloggers' Bloom Day so I didn't include it in my last post. This particular native flower is often called Cup Plant because water collects at the base of the leaves where they attach to the stem, making it a handy source of water for goldfinches and other birds who eat the seeds of the spent blooms. Cup Plant is a large plant with gigantic leaves. A little coarse, some might say. Not for every garden. Now that I've seen this flower in person and realize how big this plant is, I might end my relationship with it later this fall. But getting rid of it might not be as easy as I think because it has a tap root, and it colonizes. Yes, you have to be careful about native plants. Many grow so easily once established. 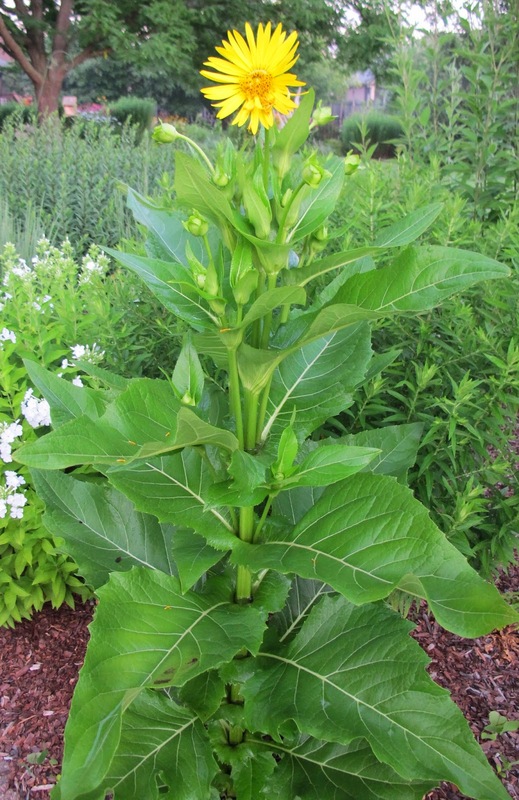 I had Jerusalem Artichoke (a kind of native sunflower)and I have been trying to get rid of it for 15 years. ha... Must be careful. Yes, a little coarse, but I wonder if you'll get to see a lot of birds coming and drinking from the leaves? Because that would be an awesome sight! Nice report on the Cup Plant. I started some from seed in the spring of 2012. A couple clumps got gigantic and bloomed amazingly last year. This spring, here in Nova Scotia, seedlings were everywhere! But I still love this plant - it is a novelty, and I like big, coarse plants in my garden. Thanks for you posts.